Tim Biancalana perfectly evokes both the spirit and imagery of John Lennon in one of the most original and effective tributes that I have ever heard (and seen). And it's all ORIGINAL material written by Tim. VILLAGE IDIOM combines Lennon's two books with the style of the Beatles 1966 Christmas record, complete with "John" reading his poems, set to sound effects. If John HAD recorded solo readings of his books, they would have sounded just like this! The CD comes with a booklet that includes Lennon-style illustrations with the words to the poems/stories/songs. Plus, Tim pulls off an effective George Harrison impersonation on one track - a parody of a real event that I've seen on a '60s European news film, in which John is reading a story from his book and George interrupts saying, "I like this one better" as he rips the pages out of John's book. Well, that was the real event - in Tim's version, John tells George to go ahead and read it himself and the result is…well, VERY George (complete with sitar)! Tim's tribute is multifaceted - not only does he write original poetry and stories in the spirit of IN HIS OWN WRITE, but also writes Lennon inspired songs. The 4 songs vary in style representing Lennon's career. "Doctor's Office Blues" sounds like an out-take from the Spector "Rock 'n Roll" sessions, "Nigel" emulates the 1966-era psychedelic Beatles, "Eat Little Sixteen" parodies their "Star Club" years and finally, "Samsara" which is a "Mind Games" styled song. 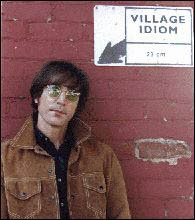 VILLAGE IDIOM not only perfectly captures the writing styles of Lennon, but his diction is flawless. I was also lucky enough to receive Tim's promo video and I've gotta say - Tim bears an uncanny resemblance to a 1966 John, in mannerisms, voice and look. Hopefully, we'll get a DVD from this multitalented Lennon tribute artist. If you loved Lennon's books, you are gonna LOVE this CD. It's almost like a new book straight from John! Speaking of new book - the full-length book version of VILLAGE IDIOM will be released very soon. EC: I think your John Lennon tribute is simply amazing. Not only do you resemble John and have his mannerisms (I'm talking about your videotape), but you add to this by writing Lennon-styled poetry and songs! How long have you been doing the John Lennon tribute? Tim Biancalana: Thank you very much. I've been a fan of Lennon since childhood and have been developing my tribute for the past three years. It's true, I do resemble Lennon and have also been perfecting his mannerisms and voice for more than twenty years. It's very timely that my book release also coincides with the anniversary of Lennon's first book, "In His Own Write," published on March 23, 1964, which became a best-seller. EC: How did the poetry come about - did you write this style of poetry before you decided to do a Lennon tribute? Tim Biancalana: First of all, I have always had a rather surreal and politically incorrect way of looking at things. I consider myself a social satirist and my poetry reflects my feelings about life and philosophy. I was inspired by John Lennon's comedic and irreverent style even though the work is very much my own. EC: How did the songs come about? What made you decide to solely do a Lennon tribute, instead of putting a 'Beatles' tribute band together? Tim Biancalana: Some of the songs were originally humorous poems from my book, Village Idiom, which I started singing to see what they might sound like. I started thinking, "What's a Lennon tribute without songs and music?" The song Samsara is the only one on the album that was specifically written as a song, i.e., most of the other songs are adaptations of poems from my book. Samsara, has a definite healing message, and reflects my beliefs about human suffering and we can rise above it. I loved writing it and when I played it back in my car the first time, I actually got a little misty-eyed and had to pull over for a minute. Ha! Ha! I am a huge Lennon fan and have always been fascinated by his life, his humor, his mind, and his creative view of things. Even though I am an actor, I had to learn the guitar to complete the picture. I've always had the ability to sing like Lennon. EC: Speaking of a Beatles tribute band, how do you present your material live? Do you do 'one-man shows'? Tim Biancalana: My one-man show, "Village Idiom," is currently in development. I plan to be performing in LA theaters and various venues this year during the 40th Anniversary of the Beatles first visit to America. Actually, my show is similar to Hal Holbrook's original one-man show based on the life of Mark Twain, which ran for many years. It will feature myself and will include a multimedia presentation of my illustrations to create a total experience. I will be playing guitar live to my accompanying backing tracks along with projected visuals of my original illustrations. It will be all smoke and miracles. EC: After seeing your videotape promo, I couldn't help but wonder if you have thought of a DVD release? I mean, the visuals that you present in the videotape are really effective! Tim Biancalana: Thank you. Yes, after having completed the book and CD I am happy to say that the next step is a DVD of Village Idiom, my one-man show. The promo video you saw was merely a low budget test run at doing just that. EC: Your website says that you are an actor. What other roles have you played other than John Lennon? EC: How have you been promoting your CD and book? TV appearances? Any kind of tour? Tim Biancalana: Right now we have the Village Idiom book and CD available on my website, and we are working with Ingram Book Company for nation-wide distribution. We are sending the book and CD out to reviewers as we speak. I am expecting a book tour and signing events to happen this year. EC: Finally, when can we expect a follow up CD or book?! Right now my main focus is to launch Village Idiom in the United States and the UK. I've merely tapped my creativity, and Village Idiom is only the first of many works to come.